Inst. of Geogr. and Earth Sc. The scanning electron microscope laboratory team welcomes visitors! 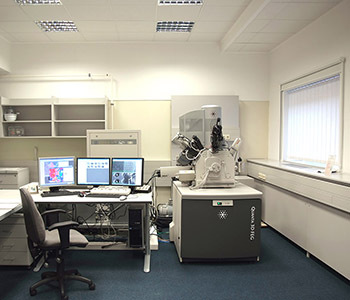 The scanning electron microscopy laboratory was established at the Eötvös University Hungary in 2010 in the framework of the Social Renewal Operational Programme of Hungary funded partly by the European Union. 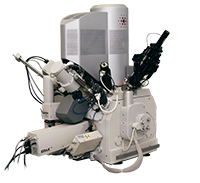 The main device of the laboratory is a FEI Quanta 3D dual beam scanning electron microscope (SEM/FIB). 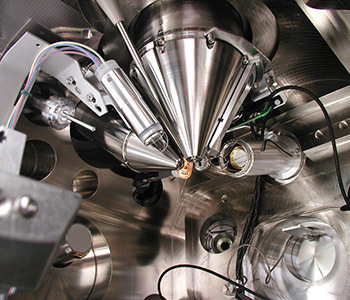 This apparatus is a versatile tool for nanotechnology and advanced materials science, moreover, opens up new dimensions in archaeology, biology, earth science, meteorite research, hydrology and many other research areas. Our laboratory is ready to cooperate not only with the research groups of our university but with external partners as well. If so, first of all read the brief outline of the equipment capabilities. Look at our introductory images! 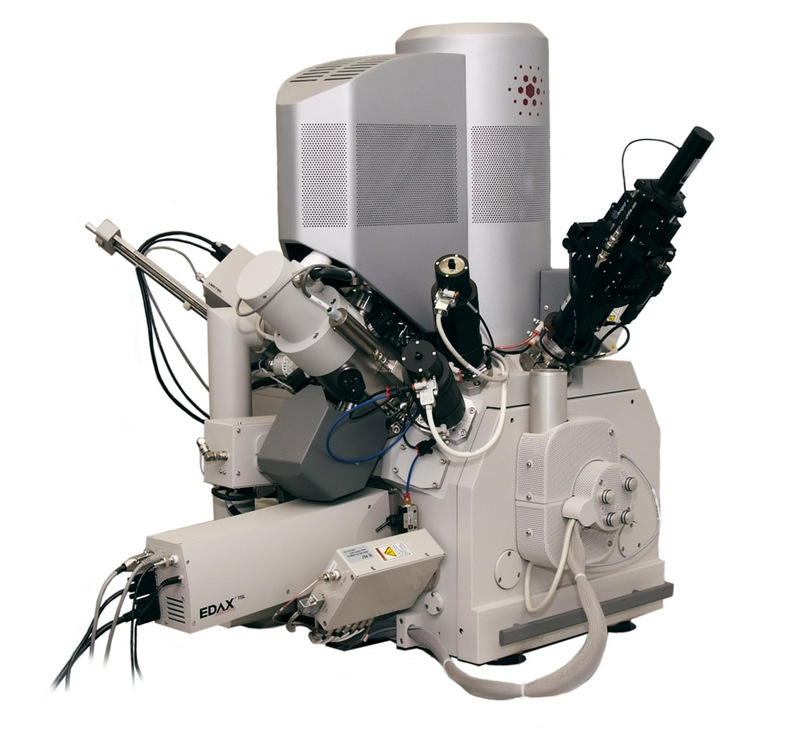 The images provide insight into the FEI Quanta 3D dual beam electron microscope possibilities. It shows some pictures inside and outside of the microscope, and a small selection from our former research images. 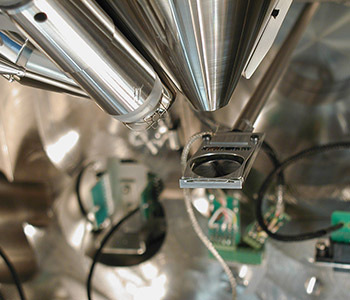 At the bottom of the microscope images one can find the most important information related to the image-making - accelerating voltage, electron current, magnification, working distance and the scale. 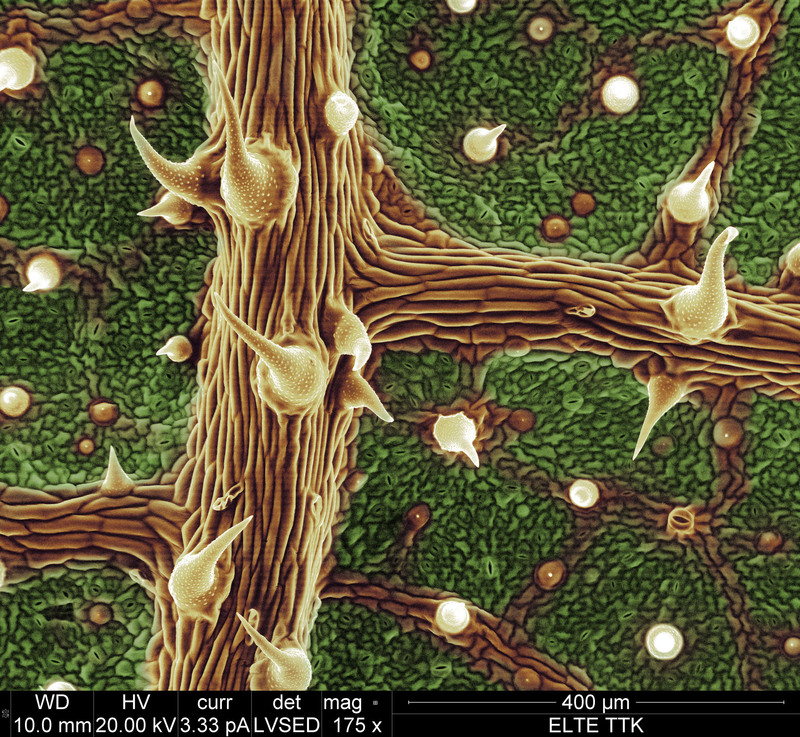 There is a micrograph competition named “Art in Microscopy” at the 18th International Microscopy Congress, Prague, Czech Republic, 7-12 September, 2014. Out of the 158 images sent for the competition the Organizing Committee has chosen 12 pictures for the final voting . Two images of the 12 finalists were made in our laboratory. These are pictures No. 1 and 10. In Life Science category one of our images came out first. The image was taken by Adrienn Baris and coloured by Szilvia Kalácska. The 5th International Students' Geological Conference was hosted by the Faculty of Science, Eötvös Loránd University, Budapest, Hungary 24-27 April, 2014. In the course of this conference a workshop was organized by the SEM Laboratory which was attended by 22 participants of the conference. In the first part of the workshop programme there was an introductory lecture about the SEM/FIB facility followed by two case studies, after which a lab visit with working demonstration was given. For the large majority of materials science studies a good quality surface is extremely important. It is of especially great importance in case of electron backscatter diffraction (EBSD) where the information depth is as shallow as some tens of nanometres and this is the reason why this analytical method requires a damage- and oxide-free sample surface. The SC-1000 SEMPrep dual Ar ion beam workstation developed by Technoorg Linda Ltd, Hungary, is suitable for both surface polishing and slope cutting of solid state samples, preparing high-quality surfaces. These surfaces allow several types of SEM investigations including the surface sensitive EBSD analysis. In the framework of a cooperation between Eötvös University and Technoorg Linda Ltd. sample preparation protocols were specified in the university SEM laboratory. A FEI “Quanta 3D FEG” SEM and its EDAX EBSD device were used to study the surface quality effects of ion milling. Budapest, 1117, Pázmány Péter sétány 1/A.